Train him to walk nicely beside you, making every time you take him out on a leash a pleasure and an enjoyable experience! As a responsible dog owner, you must be able to have your dog under control at all times. It is not acceptable for your pet to jump on passing pedestrians or dogs, nor should he be allowed to drag you down the street. Oh yes, at one time, I was that crazy neighbor who had the leash wrapped around my arm ten times and was being pulled around the block by a spastic dog. I really do love her :) Especially now that she walks with me, instead of in front of me! Even if you live on the other side of the world, I still want to be able to help you. I'm a firm believer that you can't train a dog by reading a book or watching a movie, so I recommend that you find a certified balanced trainer in your area, too. Before you begin to train your dog to walk on a leash, you need her to be comfortable with wearing one! Dog leash training is a lot easier when she isn't fighting the leash. How do you do this? Take about a week to "desensitize" your puppy or dog to the leash and collar. Just have her wear it around the house to start. Don't teach her to go get the leash, as this will encourage leash biting and chewing! Prevent - Never let your dog fetch the leash for you! A dog can't understand the difference between having it in his mouth to fetch it or grabbing it while on a walk, and it will make your dog leash training that much more difficult. Prevent - Spray the leash with bitter apple spray to prevent chewing in the first place. The awful taste should stop any mouthing or chewing. That being said, some dogs don't seem fazed by it... which leads us to #3. Give your pooch a quick pop under the chin with the top of your closed hand while the leash is in his mouth. You are not punching your dog, but simply startling him enough to drop the leash, at which point you should praise him! Try tying a shoelace to your dog's collar, and use it to give a firm "loosen, pop, loosen" while the leash is in his mouth. Never try to pull the leash out of a dog's mouth, as he'll think you're after a great game of tug-of-war. Dog leash training brings the joy back to a walk! Also at this time, find a dog training collar that is suitable to your dog's temperament, not necessarily her size or breed. For puppies under 3 months of age, stick with a plain-Jane flat buckle collar (the kind that looks like a belt). Desensitize her to this collar as well in the same way as for the leash. Your puppy or dog can wear the collar all day as long as someone is home; just make sure that you don't crate her with it on or tie her out. It's also pretty important to first tackle training your dog to sit, before attempting heeling. The reason for this is that "sit" is the foundation position that your dog will be starting from and ending in. Each and every time you stop walking, your dog should be sitting straight at your side - it goes hand-in-hand with the calm, controlled leash walking that we're after! I have a problem with simply teaching a dog "loose leash walking". You can bet your dog will still walk ahead of you, even if it's a loose leash. And that's a big part of the problem - the dog acting as the leader of the walk! So start out by getting your pup to sit on your left hand side (it helps to have already taught her how to sit). After she's sitting nicely, say "Bella, heel!" in a happy, upbeat tone of voice while stepping forward with your left leg. She'll pick up on this foot signal very quickly and be able to differentiate which foot you step with. When your dog or puppy tries to pull you or even go ahead of your left ankle by a couple inches, say nothing, and simply loosen the leash, pop back horizontally, and loosen the leash again. It should be a fast, firm correction where the collar goes tight for only one second. Don't say anything when you correct! Actions really do speak louder than words - and dogs don't understand English anyways. Don't pop your dog forward if they lag behind you, though; just coax them along with your voice or a little treat. Something soft and smelly works the best! 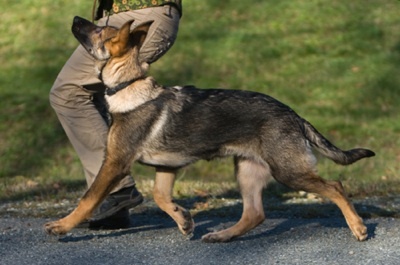 For sniffing, the most effective correction is to loosen the leash, pop up vertically, and loosen it again (a one second correction). This should get you well on your way to teach your dog or puppy to heel beside you. Dog leash training is sometimes frustrating simply because you don't know how to properly correct! I hope this has been helpful... if so, let us and our other visitors know! After you've worked on basic dog obedience training and your dog is consistently listening to you while on leash, you may be ready to move on to dog training off leash!